Sir Harold Wernher, 3rd Bt., G.C.V.O. (1893-1973), Luton Hoo, Bedfordshire, in the Entrance Lobby, and by descent. 1913 Luton Hoo Inventory, p. 20, no. 78, in the Library, as 16th Century. 1949 Luton Hoo Inventory, p. 1, in the Entrance Lobby. 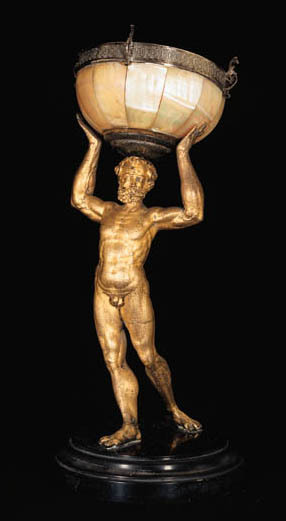 This gilt-metal figure of Atlas combines a goldsmith-like attention to finishing as well as the proportions one would normally expect of a German boxwood figure. With its exaggerated pose and fleshy physiognomy it conforms to other figures created in Augsburg in the mid-sixteenth century such as the wood figures of Adam and Eve in the Kunsthistorisches Museum, tentatively attributed by Jeffrey Chipps Smith to the circle of Christoph Weiditz (J. Chipps Smith, German Sculpture of the Later Renaissance c. 1520-1580 - Art in an Age of Uncertainty, Princeton, 1994, pp. 286-287, fig. 252).